Mexican director Alfonso Cuarón’s 2006 film Children of Men stands alongside Neill Blomkamp’s District 9 and Duncan Jones’s Moon as one of the most interesting science fiction offerings since the turn of the century. Soon after the release of that film he went into pre-production on an even more ambitious science fiction project, Gravity. After a long wait, and going through a couple of studios and numerous casting changes, that film has finally hit the screen and with it Cuarón has stepped into the realm of the truly visionary. Stanley Kubrick’s 2001: A Space Odyssey has been thrown around by a number of critics as a point of comparison and rightly so. As was the case with Kubrick’s film in the late 1960s, Gravity a massive step forward in terms of creating an experience for the viewer and giving us some idea of what it must be like to be in space. The simple narrative follows two astronauts, the rookie Ryan Stone (Bullock) and the experienced Matt Kowalski (Clooney), who are doing maintenance work on the Hubble Telescope when a field of debris from an exploded Russian satellite comes their way. Travelling so fast that it orbits the world every ninety minutes, the debris tears through everything in its path, destroying the Hubble, their shuttle and killing their crew. Stone and Kowalski are left floating in orbit, without radio contact with Earth, to try and get themselves back home. A classic survival tale, peculiarly the film is as much about being willing to let go as it is about fighting to hold on. While the screenplay and the performances from Bullock and Clooney are solid, it is the visuals; the cinematography and digital effects, that make Gravity something special. Together with cinematographer Emmanuel Lubezki, Cuarón manages to make space simultaneously terrifying and mesmerizingly beautiful. Lubezki, who was also responsible for the stunning photography of Terrence Malick’s The Tree of Life, gives Gravity a number of moments where the power of the image alone will make you say “Wow.” The film starts with one continuous, 13 minute shot in which the scenario for the film is set up, and this sets the stylistic tone. 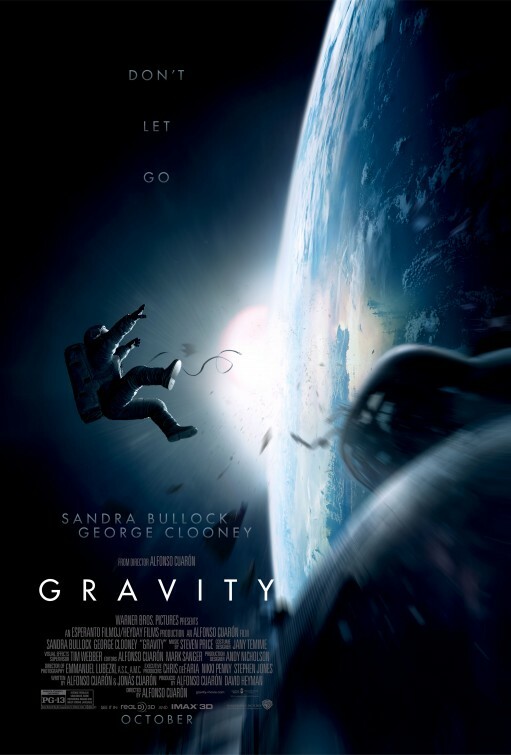 Gravity employs a number of long shots to great effect, drifting with the characters, giving the camera the same sense of weightless movement as the protagonists. The film also seamlessly moves between points-of-view. A shot may start from within the helmet of one of our characters, looking out, but then move out, turning to catch their reaction to what we’ve just seen. To get the full experience, Gravity is a film you need to see at the cinema and you need to see it in 3D. I’m not generally a huge fan of the 3D medium. Nine times out of ten it is an unnecessary gimmick used as an excuse to add a couple of dollars to ticket prices and inflate box office revenue. But there are some films, that remaining one out of ten, for which the 3D medium really works and Gravity is such a film. Cuarón’s film is experiential, it is about feeling the experience of being adrift in space, and the 3D helps to immerse you in that. Gravity is a glorious, profound piece of cinema, and while it is not perfect – there are one or two points at which the spell is momentarily broken – it is unlike any experience you will have at the movies this year.